HUNTERS are using taxidermy more and more to preserve game specimens as mementos of enjoyable hunting trips. Mounted animals are being worked into useful articles for the home, such as table lamps, book ends, gun racks, and ash trays. 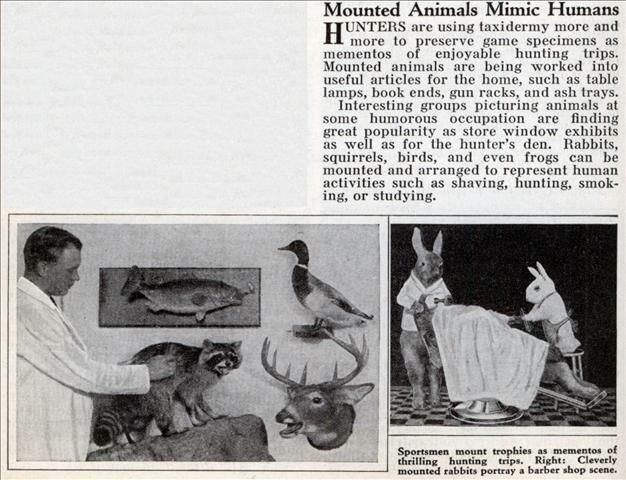 Interesting groups picturing animals at some humorous occupation are finding great popularity as store window exhibits as well as for the hunter’s den. Rabbits, squirrels, birds, and even frogs can be mounted and arranged to represent human activities such as shaving, hunting, smoking, or studying. Actually, I have been wondering how common this is. My daughter has a storybook with pictures of kittens doing various things (cooking, going to school, etc). Some of the pictures look like the kits are just propped up. Some, they look a little glassy… I was wondering whether they were taxidermied or not. This seems to indicate they may well be! Not that I’m going to tell her that, she’s only four. Hmmm…just like Walt Disney, except these animals aren’t animated. At all…they’re dead!